Barbour Wax Cotton Boot Gaiter in olive green. Barbour's Wax Cotton Boot Gaiters from their Country Sports Field range, must be amongst the most practical garments they sell. Having said that, they make ideal gifts for ramblers, game wardens, forest rangers or anyone who likes to get their boots muddy but not their trousers. Barbour's Wax Cotton Gaiter is made from heavyweight waxed cotton. It is available in olive green only as shown and in sizes medium and large. Make your choice of size from the pull down menu below.SALE! Barbour's knee length boot gaiters from their Country Sports Field range, must be amongst the most practical garments they sell. Having said that, they make ideal gifts for ramblers, game wardens, forest rangers or anyone who likes to get their boots muddy but not their trousers. Barbour's Endurance Gaiter is made from Cordura based fabric, combined with waterproof breathable lining in a 3 layer construction. 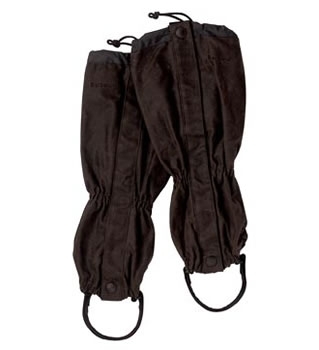 The gaiters are available in dark green only as shown and in sizes medium and large. Make your choice of size from the pull down menu below.